All any Ireland team - any Celtic team for that matter - needed for motivation was to see an English jersey in the vicinity. The passion would rise every time this foe appeared before us, driven on by our historical notions that they looked down on us. How dare they, we thought. Of course, perception and reality can be so different and off the field we forged friendships with our so-called enemy. Yes, their public image was one of arrogance - and when Martin Johnson refused to move for President Mary McAleese there was outcry and indignation - but the truth is that in top-class sport, the line between arrogance and professionalism is a thin one. And maybe those times when we despised what we thought English rugby stood for, the truth is that we actually aspired to be more like them. Anyway, no-one is going to label this current English team as arrogant. There is no motivating factor to be found there anymore. England arrive at the Aviva Stadium this afternoon grounded, humble and driven, they come in the image of their coach. 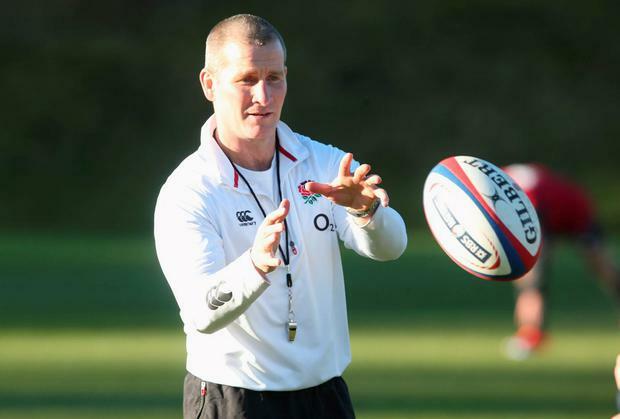 Stuart Lancaster is not someone well known to the Irish rugby public but he is someone who has had a massive impact on English rugby since taking over the reins in the fallout from the 2011 Rugby World Cup. I first met Stuart Lancaster when we played against each other, he at Leeds, myself at London Irish in 1996. He was a hard-working Northern flanker in a hard-working team with a massive passion for everything and anything in Northern English rugby. Our paths have crossed on many occasions since, first when he was Academy manager at Leeds Tykes (now Yorkshire Carnegie) where he ran one of the best organised systems you will ever come across. The hard part for Stuart was that the best players he identified left for other clubs. The likes of Luther Burrell, Danny Care, Rob Webber went on to bigger and better things at other clubs but they all got their start through him. I spent four years working for the English Rugby Football Union in charge of their regional and national academies and when I moved on Stuart took over. The way he worked in that role was that he was very hands-on with all age-grade teams right through to the England Saxons. His knowledge through his years in that role meant his knowledge of all the young players within the English system was and is second to none. Our paths next crossed when Premier Rugby (the umbrella body representing the Aviva Premiership clubs) asked me to sit on the panel that appointed the England head coach. Stuart was one of those to be interviewed and, despite his inexperience, his knowledge of all those players coming through gave him an obvious selling point. He has shown since that he doesn't mind throwing those guys in. When he was appointed there was the usual raising of eyebrows: what had he done to justify the top job in English Rugby? There were others better qualified who had coached at international level before, people who had played international rugby, who knew what international rugby was about so to speak. I would ask a simple question in reply: How did Brian O'Driscoll get his first cap? You have to start somewhere to gain experience and until you are picked in any walk of life or business for a role you will never know. The easy option is sometimes the safe one but not necessarily the right option. Stuart has really taken to the role and with it all the burdens it brings. He has bridged the relationship gap that can exist between club and international coaches by simply communicating with everybody, and also by recognising the pressures they are under. I got a call from Stuart just an hour after England lost to South Africa in November 2012 to let me know how the Harlequins players were in terms of injury. I did tell him to relax but it summed up how he wanted to ensure the club and country relationship was strong. As a result of the way he operates, he has the support of the Directors of Rugby and will get more from them in return. Stuart understands the microscope he is under this year. If England win the Rugby World Cup later this year, he will be a hero; if they lose people will say the appointment was wrong from the start. It comes with the territory. In the world we live in hindsight is the exact science which allows comment to be factual; there is no grey area. It is a pressure that Stuart will take on because he loves rugby and his country. Joe Schmidt and he may have different philosophies on how the game should be played but both are the same in one respect - they have a track record of getting the best out of those around them. The problem both face in the months ahead is the expectation around them. I left the Aviva Stadium after Ireland beat France two weeks ago annoyed with myself. I was annoyed because I was getting carried away with what this Irish team are doing at the moment. We almost take for granted the success and forget just what they are achieving, grudging in our admiration of beating France, rather than enjoying where we are as a rugby-playing nation. In a strange way, losing today might bring criticism but it would also dampen the huge, mounting expectation on the coaches, which would keep the pressure from rising to boiling point in the months ahead. Whichever coach wins today will have to deal with people thinking that Grand Slams, Championships and World Cups are a given. Lancaster and Schmidt are from the same world, both know hard work delivers success and their teams will be reminded of that pretty quickly this evening; both will want the expectation that success brings but both will be able to handle it. The players are all that count to them but both coaches deserve the accolades they get for the job they do. I cannot wait for this game. As a coach, I want to see my Harlequins players Chris Robshaw, Joe Marler and Nick Easter playing for England and being the best players on the pitch; as a neutral I want the game to live up to our expectations and be a thriller, but as an Irishman I want Ireland to win.